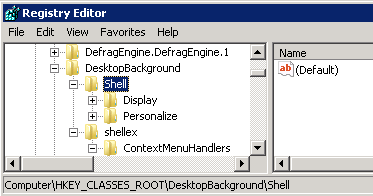 Removing Screen Resolution and Personalize shell extensions from a users desktop session. By default when working in a RDSH environment, normal users wont be allowed to access the ‘personalize’ option on the desktop. This article helps work around that. While digging into this further I found the following registry key that corresponds to the two prompts we see above. The problem with this key is, its owned by the TrustedInstaller account, and by default administrators cannot modify it. To modify this key and hide this menu from users (but maintain it for administators) please follow the below steps.